It seems likely that there was a church at Poulton in the Anglo-Saxon period, but the first historical record of a building here dates to 1094 when Roger de Poitou granted the living to the Abbey of Sees (Seez) in France. 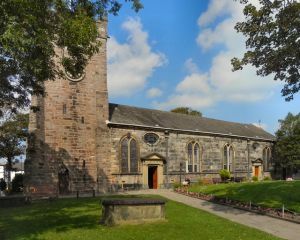 St Chad's remained in control of Sees until Henry IV decreed that foreign abbeys could no longer hold lands in England. The oldest part of the present church is the tower, which dates to the reign of Charles I. Much of the remainder was altered in 1751 when the new church in Georgian design was laid out, with the later addition of a semi-circular eastern apse, added in the 19th century. There are long Georgian galleries running the length of the church, typical of the time, though the box pews that would have stood beneath the galleries have been removed. Set into the south wall is a door giving access to the family vault of the Fleetwood Hesketh families, patrons of the church. There are over 30 burials in the vault, with the oldest being Richard Hesketh (d. 1699). Within the church are 6 funeral hatchments to members of the Fleetwood Hesketh family. This first-class bungalow is in the village of Stalmine, close to the town on Poulton-le-Fylde n Lancashire and can sleep four people in two bedrooms. This lovely detached cottage is close to the village of Stalmine near to Poulton-le-Fylde and can sleep four people in two bedrooms.